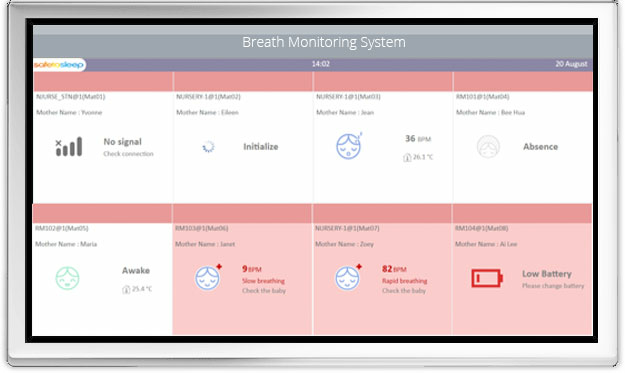 The STS System makes monitoring multiple infants easy with its built-in intelligent monitoring system. An alert appears on the monitor when an irregular breath event is detected, enabling the healthcare team to react promptly while reducing the likelihood of overlooking a critical breathing irregularity. Designed to empower and increase the efficiency of nursery staff, the STS System allows a nursery to monitor multiple infants across numerous nurseries through a single alert display. Enabled by the bassinet sized STS100 and it’s impressive breath count accuracy, leading hospitals and nurseries are using the STS System bolster their infant monitoring capabilities.